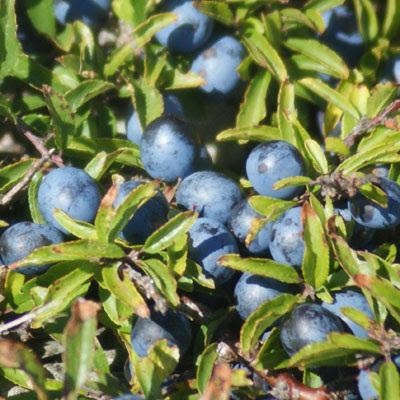 How to make sloe gin, the EASY way. Blackthorn (Prunus Spinosa) aka 'Sloe Berry bush'. With the arrival of the first frost on its way, its time to go collecting your sloes. There are plenty of instructions on the internet with measurements etc. What I am going to show you here is how to make sloe gin the easy way. Shown above is a picture of the Blackthorn bush where you will collect your sloes. ﻿1) Collect your sloe berries just after the first frost of the year. Be careful as it is very spikey Give them a good wash, and let them air dry. Sloes, sugar, gin. You will also need a fork, funnel, and large empty bottle. ﻿2) Empty your bottle of gin into a large empty bottle and store it out of the way so you don't knock it over..
﻿﻿3) Prick each sloe with a fork. The best way to do this is to roll the sloe on the points of the fork so it gets pricked 4 or 5 times. An even easier way is to just place them in the freezer and let the cold split the skin. You choose. 4) Place the pricked sloes in the bottle until the bottle is about a quarter full of berries. 5) Fill the bottle with sugar until it reaches around half way up the bottle. Use a funnel, or just a rolled up piece of card works fine. 6) Pour the gin back into the original bottle. Obviously because of the sloes and the sugar, you will have a little gin left over. Don't go drinking this just yet as you will need to shake the bottle a bit which will let the contents settle. Once this has happened, top up the gin. All the ingredients of the sloe gin added and shaken up. 7) With any spare gin, make a little bottle for a friend as it will be ready just in time for Christmas. The photo below shows what your sloe gin will look like after just one week. The sugar is dilluted and the colour has come out of the berries. ﻿﻿﻿All you need to do now is resist the temptation to drink your sloe gin, keep it in a cool dark place, and give it a little shake every day or so. As you do this you will gradually notice the gin go from a light pink to a deep black/purple. Most sloe gin is ready just in time for Christmas, but if you can, leave it until the following year, as this is when it is at its best. All the more reason to make a few bottles!!! When you are ready to drink, just filter the gin using a sieve or a flannel, discard the sloes, and return to the bottle.